Looking for the best home sauna for your personal use? You have come to the right place. We have covered everything that you would need to know about home saunas in this article. Home saunas are important products that can make your life worth living since they can make you release your stress. They can also help you to lose weight if you use them the right way. Here we will look at the top 8 models of home saunas on the market today. 2 How to Build Home Sauna? 3 How to Use Home Sauna? 4 How Does a Home Sauna Work? 5 What is the Best Home Sauna to Buy? Here are the top 8 home saunas that will provide you with the best sauna experience. 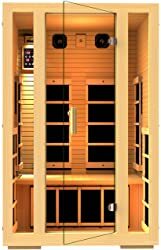 One of the best saunas that you can have at home is the JH Lifestyles Joyous 2 Person Canadian Hemlock Wood far Infrared Sauna. This is a durable product that was made to withstand constant use. It is made of double layer 100 percent Canadian Hemlock Wood that adds to its durability and attractiveness. Therefore, you can assemble it anywhere in your home and rest assured that it will complement the décor. In terms of assembly, it is very easy to assemble this home sauna since it has a grove and tongue construction. Besides, the material used to make the sauna is FSC certified, meaning that there is no plywood or chemical used to make the wood. To make your session even more enjoyable, the model comes with a volume rocker, 2 high-quality speakers, and 3.5mm AUX control. You can listen to your favorite music while you detox your body and free your mind from stress. It also comes with durable LED lighting. The lighting adds the color to make your sauna more beautiful. There is also a digital control panel that enables you to control the temperature and the time you want to use the sauna. It also comes with a 2-year warranty and you will get lifetime tech support from the manufacturer. This is yet another sauna for home use that comes from JNH. However, this time the sauna uses carbon fiber heaters to heat the system. It boasts of 8 carbon fiber FIR heaters that work together to provide the required environment. What’s more, the heaters are ETL approved, meaning that they are not only effective in what they do but also very safe. Another feature of the model is the double layer Canadian hemlock timer that makes it a durable product. The wood also comes in handy to provide the insulation required to prevent the heat from escaping out. So, you can rest assured that you are in a tight room that will provide all the healing you need. All the materials used to make the sauna are UL listed and ETL approved. This means that you can use the model with confidence and not worry about anything. Also, it comes with a 5 years warranty and has 2 premium speakers and built-in AUX control. It also comes with a digital control that enables you to control the time and temperature. This sauna is built for two persons and will allow you to experience the benefits of a sauna right at your home. It provides the automate luxury that you can ever dream of in a spacious interior that offers easy relaxation. Moreover, a built-in audio system offers a crystal-clear sound that makes you session even more relaxing as you listen to your favorite jams. 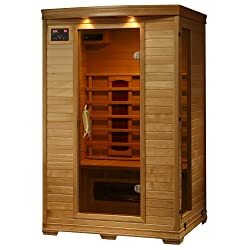 This sauna is able to relieve joint and muscle pain thanks to the FIR heat that rejuvenates your whole body by easing joint pain, warming your core temperature, and loosening your muscles. Each heater is well-placed to ensure that it heats a specific part of your body. In terms of construction, the model is made of Canadian Hemlock wood that is hypoallergenic and scar-resistant, making it great for everyday use. The wood also makes it be a durable product and offer superb insulation to prevent the heat from running out. It also has a full-spectrum color therapy that eases your stress. Also, there is a built-in radio, aux input, and CD player to allow you to listen to your music. Besides, you will enjoy superior backrest, a magazine rack, and towel hooks. You cannot afford a spa but what to experience its awesome benefits? No problem! 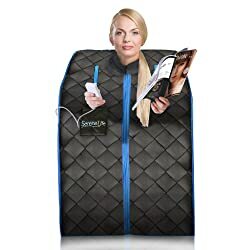 Try out the SereneLife Portable Infrared Home Spa Sauna for one person. It is an affordable product that you can ever have at your home to relax in. The package comes with everything that you will require to get assemble the sauna in the right place. This sauna is easy to move from one place to the other and you can fold it and store it when you are done. Its maintenance is also easy since you only need to wipe down the dirt and it will be clean. With this model, you will have a great time as you relax every day after a hard day at work. What’s more, it comes with 2 zippers that allow you to free your hands to do other activities like reading a book or playing with your phone. The other notable feature of the model is the chair which makes it comfortable when using your sauna. 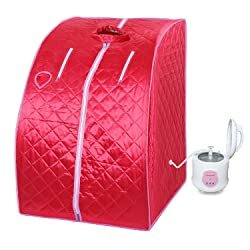 This portable sauna was designed to ensure that you save money that you would have used to visit a beauty pour. If heat is what you are looking for, the KUPPET 2L Portable Folding Steam Sauna is the model for you. It comes with great fabric that prevents the heat from escaping and its inner part is waterproof. Thus, you will achieve the best slimming effect. The model features double-sided zippers that enable you to leave your head out and take out the hands. Another thing, the model comes with a pocket where you can place your phone, remote, or any other thing. The steam sauna comes with a remote control that will allow you to change the temperature and adjust the time by yourself. Its time range from 20-60 minutes while the temperature is preset for 6 grades; you can choose your preferred grade. Safe and reliable, the steam pot goes off automatically when the water has dried. This means that you don’t need to worry about anything. It is also anti-high pressure and leakage free. It is also an easy to install a model that will take just 10 minutes to get in place. Thanks to the 9-14um, this sauna causes effective thermal effects in your body that helps to oxidize fat into the water, carbon dioxide, and other oxygen elements. As your body sweats, so does your weight reduce to enjoy a slimmer and fitter body. Another feature of the model is the convenient thermostat that makes it easier to control the sauna. It will only take you 10 minutes to detoxify, lose weight, evaporate, and cool down. Furthermore, the controller enables you to adjust the temperature from 35-75 degrees Celsius with ease. And you can easily set the time from 15-60 minutes. 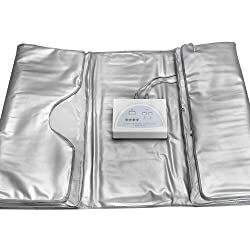 Also, the model comes with slimming blankets in all areas that detoxify your body and allow you to lose weight. The model’s outer part is made of premium quality PU material that prevents water from getting into your sauna. And the sauna is quite flexible and it allows you to take your preferred sleeping position. This gear can hold a maximum of 440.9 pounds and its hot wire is highly flexible to prevent any risk. When the temperature reaches 85 degrees the sauna will go off and ring an alarm. The model works pretty well. 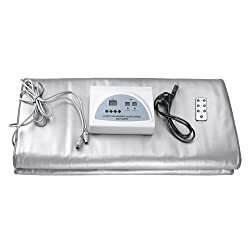 The GJCrafts Digital FIR Heat Sauna Blanket produces infrared that penetrates your body to promote blood circulation and increase body metabolism. It also makes you sweat more to reduce the water weight in your body and make you slimmer. This model can be used for different purposes including salon, hot spring, or personal beauty home care. To ensure that the model last for years, cool it down once you have finished using it and then store it. Its far-infrared material produces 9-14um of FIR radiation, which produces resonances just like a human body. This model also leads to natural thermal effects in your body. It is able to oxidize fat into the water, carbon dioxide, and other oxygen products and also makes you sweat to remove excessive body weight. It takes around 10 minutes to detoxify, lose your weight, evaporate, and cool down. You can set the temperature from 35-75 degrees Celsius thanks to its controller. Also, you can set the time to run from 150-60 minutes using the same controller. Its outer part is made of quality PU material that prevents water from getting in. And it is flexible enough to allow you to sleep in different positions. 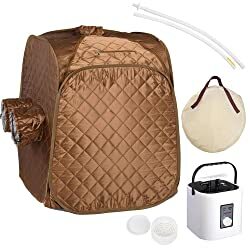 AW 2L Portable Steam Sauna Spa is a fast-fold sauna that you can easily take out of the bag and unfold it. The model is easy to use and offers a compact one-piece design. And you will be excited to learn that its fast set up makes it easy to connect or disconnect the poles. It also comes with a cotton cover that is waterproof – this prevents the steam from escaping. Besides, it comes with 2 side holds that allow you to put your legs in order to enjoy the sauna effectively. And it comes with a herbal box for placing aroma essentials and herb to enhance your detox and relaxation. It is a great model if you are looking for a product that is affordable. Also, its warranty provides peace of mind when using it. How to Build Home Sauna? The first thing you should do when building a home sauna is to buy the general building materials and lumber or go for pre-fabricated kits. Know the size of home sauna you want. This will ensure that you do not waste any material. Also, consider the style of sauna you want. An infrared sauna is easier to build than other types. Next, have an idea of how these units are built and have the right tools to assemble one. If you go for the kits, follow the instructions given (making a sauna from lumber is a bit difficult). How to Use Home Sauna? Undress – you can even go naked into your sauna. Take one or two glass water and remember to take a shower and dry before you enter the sauna. Choose the right place to rest – depending on the type of sauna you have. Use your sauna for about 6 minutes if you are a starter or 15 minutes if you are a seasoned user. Give yourself time to cool down. Repeat the process for about three times to get the best outcome. How Does a Home Sauna Work? Different home saunas work differently. For example, a traditional home sauna creates a hot room, which will heat you up and lead to sweating. This way you will be able to lose weight and detoxify your body. Infrared saunas use FIR light to heat your body directly as opposed to heating the air. They also help to detoxify your body and even make you lose weight through this process. 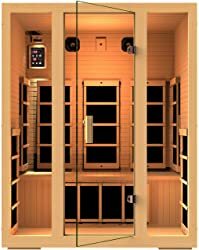 What is the Best Home Sauna to Buy? There is no one sauna that can be said to be the best for you to buy. Of important, know what you want when it comes to design, model, cost, size, shape, and durability. We hope we have done enough to make easier for you to choose the best home sauna for your use. Always get a product that will last for decades and the one that meets your needs.